Please follow the rules of the board, posting a new one question. The answer is D: you only know that one angle is 90°. So you do have for the other two angles 90°. But no more than this. Not enough information. I also wait response from quant expert. i think y>x so answer is B.
y is greater than x. The closer you move towards the 90 degrees the greater is the value of the angle. 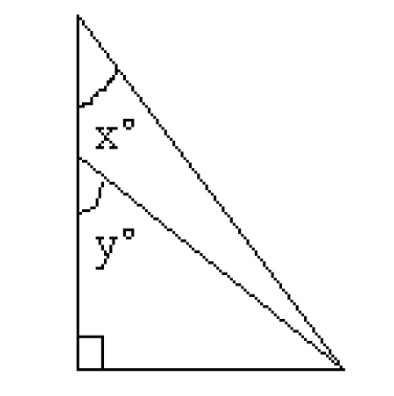 Since the figure is not drawn to scale, this means I can rotate the smaller triangle side until it coincides with the one of the larger so that angle x is equal to angle y. The only fixed information is that the angle on the left is right. Isn't it correct?